USA 6 Mexico 0. Goals: Rapinoe 3, 70, Ertz 47, Morgan 57, 80, Heath 61. The USA's road to France and the 2019 Women's World Cup got off to an impressive start with a 6-0 win over Mexico in Cary, North Carolina. Megan Rapinoe opened the scoring in the 3rd minute, and from about the 25th minute on the USA totally dominated the first half with an 11-0 edge in shots but it couldn't add to its lead. The floodgates opened, though, with three goals in the first 16 minutes of the second half en route to the biggest win over Mexico in Concacaf play since 12-0 and 9-0 wins in qualifying for the first two Women's World Cups in the early 1990s. 1. Ertz-Horan-Lavelle midfield is going to be dominant. Julie Ertz, Lindsey Horan and Rose Lavelle have started together just three times, but they could grow into the best midfield the USA has ever had. Ertz and Horan made it almost impossible for Mexico to venture past the midfield line and raised havoc in the Mexican penalty area. Horan won loose balls to set up the first two U.S. goals by Rapinoe and Ertz. Lavelle is the kind of player the USA has rarely had, a creative player who can hold the ball in the middle of the park. In recent years, it's been Rapinoe's job to do the playmaking, but mostly from her position on the left wing. Lavelle didn't often connect in the first half but her presence created tons of room out wide that the USA finally exploited in the second half. She was unlucky not to score herself, hitting the post in the first half. 2. U.S. attacking options are impressive. To give an idea of the tools Jill Ellis has at her disposal, she left Carli Lloyd and Christen Press -- 102 and 45 career goals between them -- and Mallory Pugh -- billed perhaps unfairly as the next Mia Hamm -- on the bench for the start of the game. The front three of Alex Morgan, Tobin Heath and Rapinoe combined for five goals and frankly could have had more if they had put away their chances, particularly in the first half. Once left back Crystal Dunn -- a converted forward -- got into the attack in the second half, the goals came easily. 3. Mexico remains an enigma. Was the USA that good or Mexico that bad? It was a little bit of both. Mexico was supposed to be the only Group A opponent that could give the USA a game, but it wilted under intense U.S. pressure. Its midfield was nonexistent, and the backline in front of former U.S. U-20 World Cup keeper Bianca Henninger was repeatedly beaten on second balls. All is not lost for Mexico. It should still beat Trinidad & Tobago and Panama to advance to the final four, where it should at least finish third. Concacaf qualifying is very forgiving, so even a loss in the third-place game would throw Mexico into a playoff, where it would be favored against a weak Argentina team. TRIVIA. The USA is 28-1-0 all-time in Concacaf Women's World Cup qualifying with a 164-5 goal difference. Its only loss: 2-1 to Mexico in 2010. 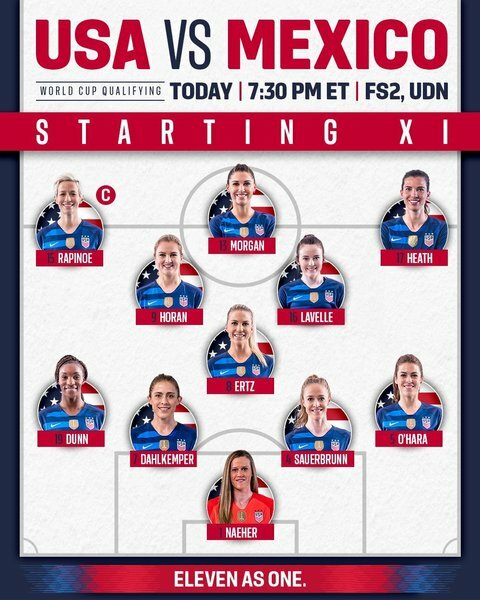 USA -- Naeher; O’Hara (Sonnett, 67), Dahlkemper, Sauerbrunn, Dunn; Ertz, Lavelle (Lloyd, 66), Horan; Heath (Pugh 77), Morgan, Rapinoe. Mexico -- Henninger; K.Robles, Bernal, Romero (Murillo, 78), Ferral; Sierra, Rangel, Antonio (Johnson 61), Mayor, Sanchez (Palacios, 47), Corral. 7 comments about "USA-Mexico Concacaf Women's Championship: World champs make it look ridiculously easy". Nick Gabris, October 5, 2018 at 11:41 a.m.
Let us seee how good they really are when they have some Real competiiton! Bob Ashpole, October 5, 2018 at 1:44 p.m.
Nick, the only "real" competition is Canada. Doesn't mean the US cannot lose to someone else. 1. As good as Lavelle is now, there is still room left for a lot of improvement in her game. In the buildup play there were several bad turnovers which Mexico could not make anything out of. 2. There were a lot of questionable and in the first half the ref seemed to have swallowed her whistle. Physical force seemed to be Mexico's defensive game plan all over the field, but it looked to me that Morgan especially was taking a beating because the nature of her position kept her from moving away to shed her Mexican defenders. I thought the US showed mental toughness. 3. I also thought there was a lot of room for improvement in the tactical decisions, especially in the second half. After the 4th goal, the US started playing extremely direct apparently in an emotional effort to score more goals. The smart thing at that point would have been to change the pace of the game and create more possession, wearing out the opponents chasing the ball around and then when switch back to a more direct play when opportunity presents. Once the subs were made, the substitutions forced the team to play a bit more possession to connect the new players. But the team needs to better control and manipulate the pace of the game. I think a lot of why the US midfield looked so good at winning the ball was a lack of skill and poor positioning on Mexico's part making it easy for the US. While there has been much progress in women's soccer in the last decade, the progress wasn't apparent in CONCACAF yesterday. Bob Ashpole replied, October 5, 2018 at 1:49 p.m. In reviewing what I wrote, people could think both sentences in par. "1" are about Lavelle. They are not. The second sentence is discussing the US midfield generally. John Soares, October 5, 2018 at 6:04 p.m.
5,000 in attendance, embarrassing. I know a lot issues/planning goes into deciding where these games are played. However, if the "chosen" cities are not going to support the team. Stage these games where "they will come". Portland, Seattle even Cincinatti and Atlanta are looking good. YES, there is the artificial surface issue. But, wasn't every game of the last WC played on artificial turf!? James Madison, October 5, 2018 at 6:57 p.m.
Scoreline impressive. Continued absence of player ratings, not improvessive. Attendance at Cary, unimpressive and bodes poorly for the NCAA Division One Final Four. frank schoon, October 6, 2018 at 1:11 p.m.
Bob Ashpole replied, October 6, 2018 at 4:55 p.m.
Frank, I bet when you wrote this you didn't know that Costa Rica beat Cuba 8-0.